Wreath size is 11 1/2" with 16 rotations. 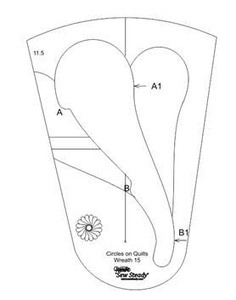 The Templates Elizabeth have will not accommodate the key gate due to their design, see graphic below of our Wreath #15. What Elizabeth should be able to do is hug her Westalee Foot on the opposite side of the template from the slot to ensure a smooth design is accomplished. Sew Steady Westalee 45° Adjustable Kaleidoscope Wedge Set 24"
Sew Steady Westalee 30° Adjustable Kaleidoscope Wedge Set 24"
Westalee WA-CHSSPIRAL8-12.5" Crosshair Square Ruler, Spiral Marking with 8 Point 12.5"
Sew Steady Westalee WR-Qtri-2, Quarter Square Triangle- 2"to 6"
Sew Steady CHS5pt8.5 Westalee Cross Hair Square 5 pt - 8.5"
Sew Steady Westalee 45° Adjustable Kaleidoscope Wedge Set 12"
Sew Steady CHS6pt8.5 Westalee Cross Hair Square Ruler Template 6 Point, 8.5"
Sew Steady Westalee 30° Adjustable Kaleidoscope Wedge Set 12"
Westalee WT-CHB-2 Large Continuous Heart Border Tool Templates, 2-pc Tool: 4" x 2", 6" x 3"
Sew Steady Westalee WT-FSPINE Feather Spine Templates 10" or 12"
Westalee WT-CHB Small Continuous Heart Border Tool Template, 2pc Tool: 2" x 1", 3" x 1-1/2"
Sew Steady Westalee WA-SPG Spacing Gauge with 1/8, 1/4, 1/2, and 1" Measurements when using rulers and templates. Westalee WT-SR Westalee Straight Rulers 20 Sizes To Choose From 1-1/2 x 4" to 3 x 18"